The Chair has look of Imported Chairs in similar design and looks with arms in PU Leatherite Upholstry. The Chair is made in round pipe in Stainless Steel look. The arms rest has wooden top rest which gives the chair a wonderful look. The Chair is very good for visitors in any office. The SS Finish/ Crome look will give the office an elegant and very attractive look. 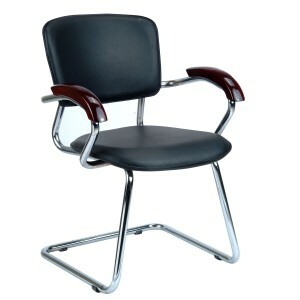 Theame chair is Made in India with very firm and strong frame.